I am always nervous when I pick up YA novels (I say pretty much the same thing every time I start a review of a YA), as it is so hard to find a book that defies formula, breaks into new territory, and rips your heart out. Guess what? 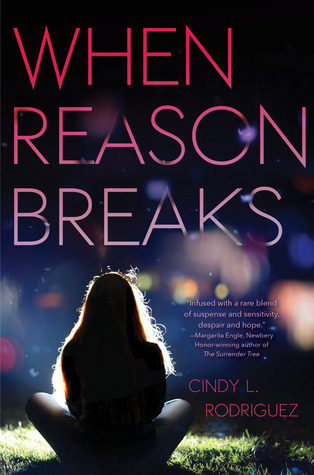 When Reason Breaks (Cindy L. Rodriguez) is most definitely a great novel. Plus, it’s a diverse book! Two sophomore girls come from different worlds. Emily is the sweet, smart daughter of a lawyer/politician father who controls most aspects of her life; she loves her friends Sarah and Abby, and her boyfriend, Kevin. Elizabeth is a dark goth girl whose father has recently run out on, making her the ‘basket case’ of the school, with anger issues and a tendency to draw dark pictures. When their English teacher, Ms. Diaz, places them together in class, they grow together over a love of Emily Dickinson, whose poetry will push them to reconsider many aspects of their lives. The novel deals with the harsh topics of mental illness and suicide, while drawing parallels between the lives of the two young protagonists and Emily Dickinson herself. It will have your heart racing, your hands stuck to the cover, unable to put the book down. Full disclosure; for the first half of the novel, I wasn’t convinced about if I liked it or not. I found the protagonists slightly pretentious, slightly predictable, and I felt as if I had seen them before. But as the plot progressed, I realized that the feeling of familiarity came from the fact that I did know people just like them. I recognized their thoughts and feelings as those I had myself felt, or had experienced second hand as I stood alongside a friend through a tough time. It was honestly the end of the third act (if you would want to call it that – you’ll know what I mean when you read it yourself) when the book grabbed me. The book begins with a dark chapter, after which the novel then takes you back eight months, to show what series of events has brought them to this point. Just like Ms. Diaz, I made assumptions about this moment; when I saw that I was wrong, my entire perception of the book shifted. My heart raced as I realized… “I am part of the problem,” a scary thought. I suddenly saw the novel in a different light; when I finally finished it, I had to put it down, stare at the ceiling, and think everything over in my head. Just… wow. But what made it so much more interesting was the introduction of Emily Dickinson as the inspiration for the women. During the course of the book, the protagonist offer different interpretations to some of the most famous poems, making them their own. And after the novel ends, the author offers insight into the life of our favorite lady poet, showing us just how every character reflects part of her past. It’s fantastic how she is able to do this without making the book feel like a perfect replica of Dickinson’s life, or preachy in any way: it’s subtle. It was an actual emotional roller coaster; it reminded me of Thirteen Reasons Why (Jay Asher), crossed over with The Breakfast Club. I recommend tissues! When Reason Breaks comes out February 10th. Oh look, a book trailer!